Fishers | The Evelo Team : Fishers, Noblesville, Carmel & Indianapolis area REALTORS. Just 15 miles north of Indianapolis, the town of Fishers, Indiana, has grown tremendously over the past decade, but still maintains a strong sense of community and family values. 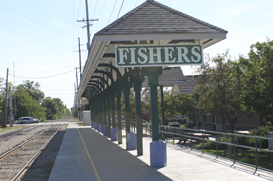 With a population of 38,000, Fishers is located conveniently along I-69, providing easy access to Indianapolis and putting it within a few hours drive of a number of other metropolitans including Cincinnati, Louisville and Chicago, and within 30 minutes of Indianapolis International Airport. Fishers students attend Hamilton Southeastern Schools, some of the top-rated schools in the state. The district serves about 14,000 students through 11 elementary schools, five intermediate/junior high schools, and two senior high schools. Despite phenomenal growth of about 1,200 students per year since 2000, the district continues to excel on standardized testing and achievement measures. Fishers residents can take advantage of seven parks, offering athletic fields, picnic shelters, playgrounds, community buildings, walking trails and more. The annual Fishers Freedom Festival brings locals out every June for food, fireworks, arts, crafts, entertainment and more. Fine healthcare facilities are also available nearby, at Community Hospital North, Riverview Hospital and St. Vincent Carmel Hospital. The community embraces a diversity of faiths, with more than 40 churches representing most major denominations. Fishers offers a wide range of real estate options, with prices ranging from $100K to $1 million. New home communities are sprouting up constantly. Also available are condos, townhomes and golf course homes.